In St. Louis Cardinals playoff action, Memphis was stopped by wet grounds and Palm Beach was eliminated by Fort Myers. Luken Baker plated three and Johan Oviedo threw six scoreless innings in Peoria’s opening win. Recaps of games played on Wednesday, September 5. Due to rain in Oklahoma City, the first game of the Pacific Coast League Semifinals was postponed on Wednesday. The Redbirds and Dodgers will make up the contest with a doubleheader of seven-inning contests on Thursday that will start at 5:05 PM Central time. Kevin Herget will start the first game for the Redbirds, and Tyler Lyons will toe the rubber in the second contest. Thursday’s games: Kevin Herget and Tyler Lyons (0-0, 0.00) at Oklahoma City Dodgers, 5:05 PM Central time. With a 3-1 loss in Tuesday’s contest, the Cardinals suffered the same fate on Wednesday to the Miracle (MIN). With two defeats to open the best-of-three series, the Cardinals’ season ended on Wednesday night. Palm Beach second baseman Irving Lopez drove in his club’s only run with a sacrifice fly to score first baseman Stefan Trosclair in the third inning. Lopez and catcher Jose Godoy each had two base hits, as the Cardinals combined for nine. Going 0-for-6 with runners in scoring position, Palm Beach left 11 runners on base. Starter Ian Oxnevad allowed two runs in 4 2/3 innings. The runs came via a two-out home run in the top of the third inning, leading to a loss for Oxnevad. Reliever Will Latcham worked the next 1 1/3 innings and surrendered a run before Jacob Patterson and Bryan Dobzanski combined for three scoreless frames to round out the game. Two runs in the fourth inning and another in the fifth propelled the Chiefs to a 3-0 victory to open their first-round playoff series with the River Bandits (HOU). Peoria snapped its six-game losing skid. 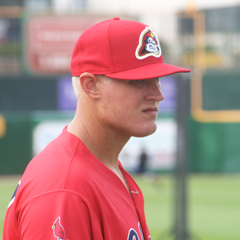 Chiefs designated hitter Luken Baker, our Player of the Day, drove in all three runs for Peoria on Wednesday. Baker launched a two-run homer in the fourth inning and added a sacrifice fly in the fifth. Though they scored enough runs to win, the Chiefs had 13 strikeouts on Wednesday. Third baseman Nolan Gorman fanned three times, and four players struck out twice. 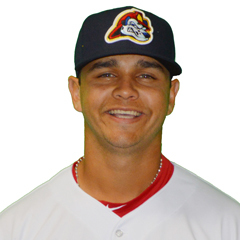 On the mound, Chiefs starter Johan Oviedo turned in a quality start. The 20-year old worked six scoreless innings and held the River Bandits to just three base hits with seven strikeouts. Robbie Gordon and Patrick Dayton each earned a hold before Kodi Whitley recorded the final four outs to collect a save. Thursday’s game: Zach Prendergast (0-0, 0.00) at Quad Cities River Bandits, 6:35 PM Central time.